The Wolff Co. purchased 17.4 acres on Wellness Place in Henderson from InvXtus Properties for $8.01 million or for $460,000 per acre. The site is fully improved with all utilities in place. John Stewart of Juliet Property Co. represented InvXtus Properties and the Wolff Co. handled the purchase in house. The company plans to develop the site as a 396-unit multifamily community with swimming pool, garages and a clubhouse. ▶ ABJ Group Enterprises purchased the 160-unit Rancho Miranda Apartments at 1650 N. Pecos Road in Las Vegas for $10 million or $62,500 per unit. Robin Willett of NAI Vegas represented the ABJ Group and Art Carll of NAI Vegas represented the seller, California Capital Real Estate Advisors. 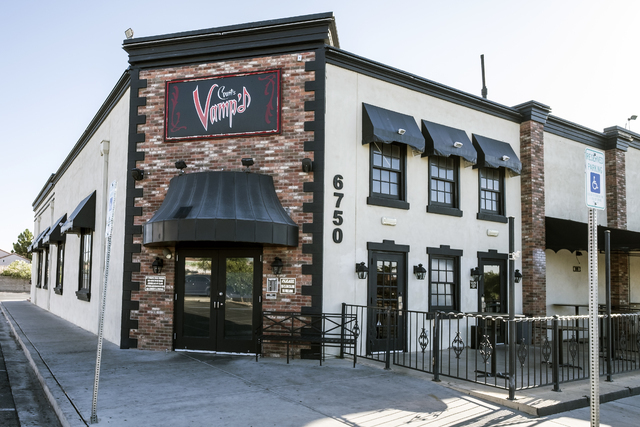 ▶ Count’s Vamp’d purchased the 6,769 square feet of retail space it occupies at 6750 W. Sahara Ave. in Las Vegas for $2.6 million. Tina D. Taylor of Marcus &Millichap represented the seller, AJL Properties LLC. ▶ Flip For Me Gymnastics Inc. purchased 9,729 square feet of industrial space in Wigwam Jones Industrial Park at 5895 W. Wigwam Ave. in Las Vegas for $1.167 million. Dan Doherty, Susan Borst, Chris Lane and Jerry Doty of Colliers International represented the seller, MCA Wigwam LLC. ▶ Primo Properties LLC purchased 4,090 square feet of office space is in the Park at Warm Springs at 157 E. Warm Springs Road in Las Vegas for $760,000. Dean Willmore and Chelsy Cardin of Colliers International represented both the seller, CAPNA Holdings LLC, and the buyer. ▶ B Dragon Corp. purchased 4,925 square feet of industrial space in Badura Industrial Center at 6635 Badura Ave., Suite A-2, in Las Vegas for $591,000. Suzette LaGrange and Kara Walker of Colliers International represented the seller, Castillo LLC. ▶ Immersa Learning Network purchased 4,925 square feet of industrial space in Badura Industrial Center at 6635 Badura Ave., Suite A-1, in Las Vegasfor $570,000 from Peter Lik Badura LLC. Suzette LaGrange and Kara Walker of Colliers International represented the buyer. ▶ Maintenance Supply Headquarters leased 44,051 square feet of industrial space at 880 Wigwam Parkway, Suite 140, in Henderson from Harsch Investment Corp. Dean Willmore and Chelsy Cardin of Colliers International represented the tenant. ▶ J.C. Bromac Corp. dba EagleRider leased 33,064 square feet of industrial space in Safari Business Center at 7660 Dean Martin Drive, Suite 205-206, in Las Vegas. Greg Pancirov of Colliers International represented the tenant. ▶ Easy Street Realty Las Vegas Inc. leased 7,144 square feet of office space at 6655 S. Eastern Ave. in Las Vegas. Renae Russo of Colliers International represented the landlord, 6655 Properties LLC. ▶ SG 2013 LLC leased 6,960 square feet of industrial space in Arrowhead Commerce Center, Building 1 at 6290 S. Pecos Road, Suite 100 &200, in Las Vegas. Spencer Pinter, Dan Doherty, Susan Borst, Chris Lane and Jerry Doty of Colliers International represented the landlord, KTR LV IV LLC. ▶ El Sol Produce Inc. leased 6,250 square feet of industrial space in Nellis Industrial Park No. 1 at 4508 Mitchell St. in North Las Vegas. Dan Doherty, Susan Borst, Chris Lane and Jerry Doty of Colliers International represented the landlord, Icon PAC Nevada Owner Pool 3 Nevada. ▶ XPO Last Mile Inc. leased 5,722 square feet of industrial space in Arrowhead Commerce Center, Building 6 at 6275 S. Pearl St., Suite 700, in Las Vegas. Spencer Pinter, Dan Doherty, Susan Borst, Chris Lane and Jerry Doty of Colliers International represented the landlord, KTR LV IV LLC. ▶ Nelbud Services Group Inc. leased 5,280 square feet of industrial space in Spencer &Helm Business Center at 6672 Spencer St., Suite 500, in Las Vegas. Spencer Pinter of Colliers International represented the landlord, EJM Spencer Helm Property LLC. ▶ Andrzej Michniak leased 3,828 square feet of industrial space in the Petersen Industrial Center at 4535 Statz St., Suite G, in North Las Vegas. Greg Pancirov and Mike DeLew of Colliers International represented the landlord, DM Real Estate Holdings LLC. • Lightworks LLC leased 3,369 square feet of industrial space in the Valley Freeway Center Phase III at 7715 Commercial Way, Suite 120, in Henderson. Greg Pancirov and Mike DeLew of Colliers International represented the lessor, VFC III Industrial Buildings LLC. ▶ R.S. Associates Inc. leased 3,300 square feet of industrial property in Harsch Trident Industrial Center at 537 E. Brooks Ave., Suite 408, in North Las Vegas. Greg Pancirov and Mike DeLew of Colliers International represented the tenant. ▶ Amy and Claud Borders dba Ensemble Music leased 2,851 square feet of retail space in Spanish Hills Plaza at 5325 S. Fort Apache Road, Suites E and F, in Las Vegas. Robert S. Hatrak II of Virtus Commercial represented the landlord, DTS-S. Fort Apache LLC. ▶ Dance For Less Inc. leased 2,800 square feet of industrial space in the Patrick Airport Center at 2700 E. Patrick Lane, Suite 18, in Las Vegas. Dean Willmore, Mike DeLew, Greg Pancirov and Chelsy Cardin of Colliers International represented the landlord, Stockbridge Patrick and Mojavae LLC. ▶ Capitol Builders Hardware Inc. leased 2,740 square feet of industrial space in Patrick Airport Center at 2700 E. Patrick Lane, Suite 17, in Las Vegas. Dean Willmore, Mike DeLew, Greg Pancirov and Chelsy Cardin of Colliers International represented the landlord, Stockbridge Patrick and Mojave LLC. ▶ Fernando Ruvera leased 2,575 square feet of industrial property in the Craig Business Center at 3853 E. Craig Road, Suite 11, in North Las Vegas. Greg Pancirov and Mike DeLew of Colliers International represented the lessor, T Properties LLC. ▶ Grand Investments, Inc. dba Amy’s Donut Factory &Gourmet Creamery leased 1,957 square feet of retail space in the Anthem Village Center at 2505 Anthem Village Drive, Suite 1B, in Henderson. Jakke Farley of Virtus Commercial represented the tenant and Brian Sorrentino of ROI Commercial represented the landlord, Anthem Village LLC. ▶ Robert E. Larson leased 1,873 square feet of industrial space in Patrick Airport Center at 2700 E. Patrick Lane, Suite 13, in Las Vegas. Dean Willmore, Mike DeLew, Greg Pancirov and Chelsy Cardin of Colliers International represented the landlord, Stockbridge Patrick and Mojave LLC. ▶ Kelly Nguyen dba Nail Salon leased 1,214 square feet of retail space in the Buffalo Alta Center at 450 S. Buffalo Drive, Suite 108, in Las Vegas. Brett S. Beck and Jeff Mitchell of Virtus Commercial represented the landlord, Buffalo Alta Center LLC. ▶ Rich Robotics Corp. leased 1,133 square feet of office space in the Green Valley Professional Center at 2501 N. Green Valley Parkway, Suite 134D, in Henderson. Chris Connell and Grant Traub of Colliers International represented the landlord, 2625 GV LLC. ▶ J3 Strategies LLC leased 967 square feet of office space in The Park at 3900 at 3900 Paradise Road in Las Vegas from RREF II CGM Office LLC. Suzette LaGrange and Kara Walker of Colliers International represented the tenant. ▶ Auto Buyline Systems Inc. leased 3.53 acres of industrial land at 2180 Pama Lane in Las Vegas from Julius Realty Corp. Dean Willmore and Chelsy Cardin of Colliers International represented the tenant.